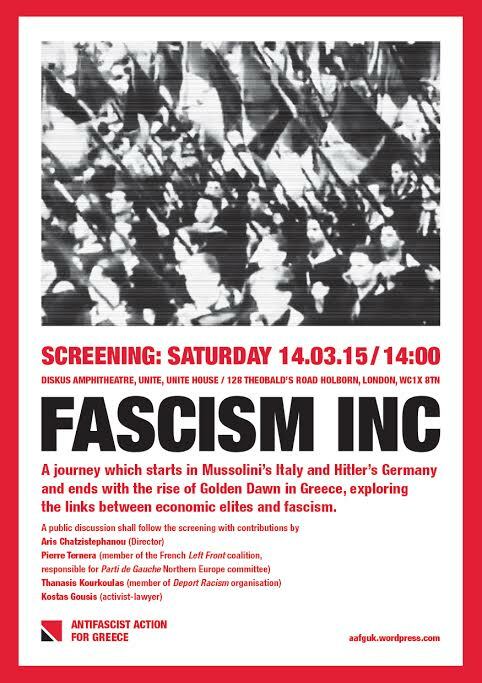 Come along for the screening of the documentary “Fascism Inc.” by Aris Chatzistephanou. The documentary explores the links between economic elites and fascist movements in Europe, both in the past and the present. The journey starts in Mussolini’s Italy and Hitler’s Germany, reaching to recent times and the rise of Golden Dawn in Greece. A public discussion will follow the screening with contributions by Aris Chatzistephanou (Info-War Productions), Costas Gousis (Lawyer and activist), Thanasis Kourkoulas (“Deport Racism” movement), and Pierre Ternera (Parti de Gauche). This entry was posted in Events & Actions and tagged AAfG, documentary, event, fascism, screening by Anti-Fascist Action for Greece. Bookmark the permalink.